Pa Kent fiddles with kitchen gadgetry in the middle of the night, frustrated because of the events going on with Zod and the Kryptonians attacking Superman. Martha comes down, and they share a distraught moment before Jonathan shares with her a reason why he has confidence. He relates the tale of the time Superman took him to the Fortress and used a sunstone to help him fulfill a lifelong dream, going into space. They create ship and fly out to the far reaches, where Superman encounters a distress signal. A Sun-Eater. Despite the Sun-Eater's overwhelming power, Superman manages to use a temporal distortion bomb to take it apart, and together with Pa they manage to get back home in one piece. Reassured but still wary, they retire. All I have to ask is where the heck this was all through the delays. If they had done this the minute they knew it was going to be behind, they'd have twice as many readers now, because these fill-ins ROCK. The re-introduction of the Sun-Eaters is a concept I'm warm to, and I hope they make them the menace they seem to be, and have a great story to go along with them. The hints are dropping that future potentialities are going to come to pass, and I can't wait to see what will be done with it. All in all, a heartwarming, fun story that didn't need decompression. This is rare, and when it works, beautiful. Art - 5: Renato just flat-out PEGGED the action, the characters, the evolved Ma and Pa, and even the Sun Eater concept. I very much enjoyed the work here, and the coloring, which Guedes did, enhances the art and compliments it. Very good, and human, and real. Cover Art - 4: A bit archetypical, there's nothing new here, but the pose fills the format nicely and gives a huge sense of depth. 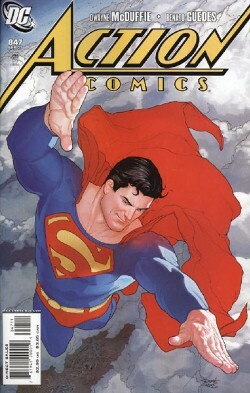 What I like best is that it fits in with the almost seemless consistency of the Action Comics books so far. There is a distinctive new feel to the current books that has an almost shared feeling to it, like every artist, even ones that go in another direction from their cohorts, work towards the same general universe. I haven't seen that since before Berganza.